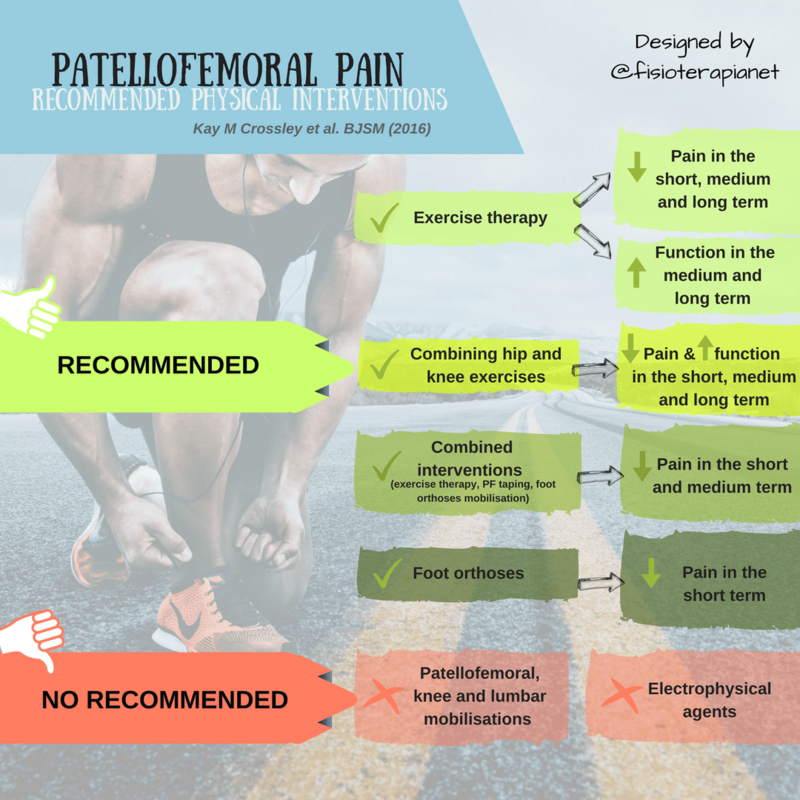 In this infographic you can find a summary of the main the recommendations for the treatment of patellofemoral pain. I advise you to read the original article (link at the bottom), to have a better understanding of the different points exposed here. Exercise therapy Reduces pain in the short, medium and long term and improves function in the medium and long term. Combination of hip and knee exercises. Reduces pain and improves function in the short, medium and long term. Combined treatment (exercise therapy, taping, orthoses, mobilization). Decreases pain in the short and medium term. Orthoses. Reduces pain in the short term. Lumbar, knee and patellofemoral mobilization. This infographic is based on the paper Patellofemoral pain consensus statement from the 4th International Patellofemoral Pain Research Retreat, Manchester. Part 2: recommended physical interventions (exercise, taping, bracing, foot orthoses and combined interventions) by Kay M Crossley et al. (2016). Physiotherapist, Social Media Expert and passionate about knowledge translation. Member of the Health and Care Professions Council (HCPC) and the Chartered Society of Physiotherapy (CSP).